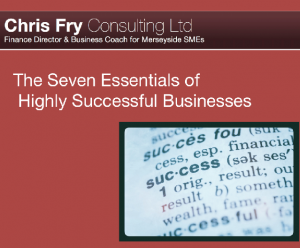 In this blog I’ve put together what I consider to be the seven essential elements of a successful business. These are the things that start-ups and small and medium-sized enterprises need to focus on to establish and grow their businesses into thriving and successful establishments. The insight in this blog has been gained from over 20 years experience working with small, medium and blue chip businesses in senior finance roles and at boardroom level. I’ve shaped what I have learned into this two-part blog. It provides an introduction to some of the key elements to put in place to achieve business success. When working with clients as a freelance finance director or business coach, these are the topics to which I bring my expertise and focus, freeing up the business owner to focus on their strengths and day to day operations. “In this article I want to give you a simple model that will enable you to evaluate your business and to identify where you might make improvements. The 7 essentials that I’ve mentioned in the title refer to 2 foundational principles and 5 core business processes that every business needs to deliver on if it is to survive and thrive. Most small businesses will get by without needing to devote too much time and attention to the principles…but to be truly successful every business will need to devote them time and attention eventually. To read the blog, simply click here, and feel free to share the blog with your business contacts. I hope you find it useful.